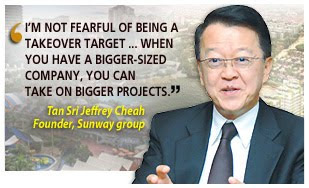 Tycoon Tan Sri Jeffrey Cheah plans to merge the construction and property firms he controls, Sunway Holdings Bhd and Sunway City Bhd (SunCity), in a deal worth RM4.5 billion to compete more effectively at home and in the region. The move, which is likely to create Malaysia's fourth largest property company by market size, is the third property-related merger to be anounced this month. Earlier this month, UEM Land Holdings Bhd said it wanted to merge with Sunrise Bhd to create the country's largest property group with a market size of over RM9 billion. On Tuesday, IJM Land Bhd and Malaysian Resources Corp Bhd announced their merger plans to become the second largest group. "This merger gives us the benefit of size, synergy and branding," Cheah, the Sunway group's founder, told reporters at a press conference yesterday. He said the timing for such an exercise was good, with the share prices of both companies having come up to "a very equitable" level. The two firms' assets and liabilities will be acquired by a new company, Sunway Sdn Bhd, which will be listed in their place on Bursa Malaysia. The deal, including the listing, is expected to be completed by the middle of next year. The merged entity will potentially have a market capitalisation of RM3.5 billion, combined revenue of RM3.3 billion and total assets of about RM8 billion. It will also have a presence in 12 high-growth markets in the region and over 9.7ha of landbank, Cheah said. He dismissed a suggestion that the merger was a move to help it stave off any potential takeovers, saying it had more to do with right market conditions and the need to scale up for size. "I am not fearful of being a takeover target," he remarked, adding that "when you have a bigger-sized company, you can take on bigger projects". The two firms' businesses will be acquired by Sunway at an equivalent of RM2.60 for each Sunway Holdings share and RM5.10 for each SunCity share. 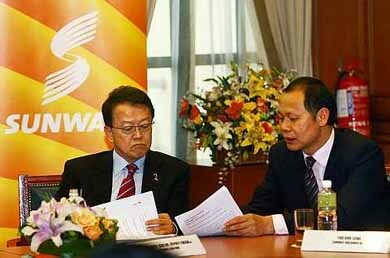 Sunway will pay with RM900 million cash and Sunway shares, with free warrants attached. After the purchase, Sunway Holdings and SunCity will undertake a capital repayment exercise to distribute the proceedings to shareholders. Cheah, who now owns 46 per cent of Sunway Holdings and 44 per cent of SunCity, said he would retain a controlling stake of about 44 per cent in the new entity. The second largest shareholder will be The Government of Singapore Investment Corp, with a 12 per cent stake. Shareholders will have to approve the merger at an extraordinary general meeting, at which Cheah will refrain from voting. Sunway Holdings and SunCity yesterday reported third quarter net profits of RM48.5 million and RM138 million, respectively. "Going forward, (with the merged entity), we're still confident of double-digit growth (in financial performance)," Cheah said. Trading in both the stocks, which have been suspended since yesterday pending the merger announcement, will resume today. Sunway Holdings was last traded at RM2.25 and SunCity at RM4.49. PETALING JAYA: Sunway Holdings Bhd and Sunway City Bhd (SunCity) have received a takeover offer from Sunway Sdn Bhd (Newco), a company controlled by Tan Sri Jeffrey Cheah (pic), for RM4.5bil in cash and share swap. The exercise entails Newco offering RM2.60 per Sunway share, RM1.50 per Sunway warrant and RM5.10 per SunCity share and RM1.29 per SunCity warrant. The offer prices are to be satisfied via the issuance of an equivalent value of Newco shares representing 80% of the offer prices and the remainder 20% in cash. The offer would include Newco issuing new warrants for free to all shareholders of SunCity and Sunway on the basis of one Newco warrant for every five Newco shares. Based on SunCity and Sunway Holdings' last traded prices of RM4.49 and RM2.25 respectively, the offer price represented a premium of 13.6% and 15.5% respectively. This transaction will see three key advantages, namely size, synergies and branding, Cheah, who is also the chairman of the Sunway group, said in a briefing to announce the corporate exercise. The immediate and obvious advantage of this merger is a bigger and better capitalised entity. Once the offer is accepted and approved, the merged company will have a potential market capitalisation of over RM3.5bil, he said, adding that based on analysts consensus, the merged entity would have combined total revenue of more than RM3.3bil. As at June this year, total assets for both companies stood at more than RM8bil. To a question, Cheah said the merger was due to right market conditions. He said the timing was good and the share prices of both companies had come to an equitable level. It's a good time to do it (merging). Asked if the move was to prevent a takeover by others, Cheah said the group was not fearful of being taken over. Size brings us opportunities. We will have access to a larger market and the ability to bid for projects with higher value, particularly in international markets, he said. Following the corporate exercise, both Sunway Holdings and SunCity will be delisted. Subsequently, Newco will seek a new listing on Bursa Malaysia subject to obtaining the required approvals. Newco, owned by Cheah and his daughter Sarena Cheah, will consolidate all business operations of both companies under one listed entity, Sunway Bhd. The exercise is expected to be completed by mid-2011. Following the acquisition, Sunway Holdings and SunCity will proceed to distribute Newco shares, cash and Newco warrants to its respective shareholders through a capital reduction and capital repayment exercise. Cheah and Sarena currently own direct and indirect stakes of about 43.68% in SunCity and 46.53% in Sunway Holdings. Their stake is around 44% in the merged entity. Sunway Holdings reported a net profit of RM48.5mil, or 8.4 sen per share, in the third quarter ended Sept 30 on the back of RM489mil in revenue, driven by the construction, property development and trading and manufacturing divisions. Sunway Holdings said its quarterly results included a RM4.9mil gain arising from the adoption of FRS 139. For the nine months ended Sept 30, Sunway Holdings posted a net profit of RM136.99mil on revenue of RM1.49bil. Cheah said the group had been growing quite nicely. However, he said the rate of growth might not be huge due to the larger base. In the notes accompanying its financial results, Sunway said the construction division was expected to record impressive profits backed by a healthy outstanding order book of RM2.3bil of which about 60% are overseas construction contracts. The group also expects sustainable activity in the local construction scene in the next few years with the pick-up in private development activities as well as from the recent announcement of the Budget 2011 and Economic Transformation Programme. The property development division has unbilled sales of RM400mil from existing property projects, both locally and overseas. This division will continue to contribute positively to the group's earnings in the current and coming year with income from upcoming property launches, it said. KUALA LUMPUR: Syarikat Majuperak Bhd, a wholly-owned unit of Majuperak Holdings Bhd, has teamed up with Xtreme New Sdn Bhd to develop a mixed township worth RM700mil in Batu Gajah, Perak. Its chairman, Datuk Seri Raja Ahmad Zainuddin Raja Omar, said the project, involving about 240 ha, was expected to be completed within 10-15 years. For a start, the company plans to develop a theme park with foreign companies, he said at the joint-venture signing ceremony between both companies here yesterday. He said currently, the company was in talks with several foreign companies from Australia and China to develop the theme park. The talks are expected to be concluded in a couple of weeks, he said. Raja Ahmad Zainuddin said the ground-breaking ceremony was expected to be held early next year. PETALING JAYA: Analysts are generally positive on the merger proposal between IJM Land Bhd and Malaysian Resources Corp Bhd (MRCB) although details of the proposal have yet to be revealed. On Tuesday, IJM Land and MRCB signed a memorandum of understanding pursuant to the proposal that only revealed the merger would involve a share-swap whereby the shares of IJM Land and MRCB would be exchanged for shares in a new incorporated company. The exchange price is RM3.65 per IJM Land share and RM2.30 per MRCB share. Kenanga Research said the offer price for MRCB and IJM Land was pegged at 2.6 times and 2.48 times price-to-book value respectively. It said this was fair considering that the combined entity would have a market capitalisation of RM7bil and would become the second largest property company with improved liquidity and market positioning that would appeal to foreign institutional investors. Kenanga said the new company would essentially be a property company and would look to divest its other businesses like infrastructure, concession and construction. The research house said it would also be a formidable entity with a stronger balance sheet and would stand a better chance in securing a meaningful role in the development of the Employees Provident Fund's (EPF) Rubber Research Institute land. We advise investors to subscribe to the offer and convert their shares to the new company shares. Only then will they be able to participate in the new growth under the might of the combined entity, Kenanga said in a report yesterday. OSK Research viewed the proposed merger as synergistic and complementary to both property businesses given the different strengths of MRCB and IJM Land. At present, MRCB's property development activities are mostly in the commercial sector and concentrated in the Klang Valley with its flagship project, KL Sentral, commanding a gross development value of over RM12bil. IJM Land's strength is in its township and residential developments in the Klang Valley, Penang, Johor, Negri Sembilan, Sabah and Sarawak. OSK Research said the RM2.30 offer price for MRCB was somewhat fair but not quite attractive due to the small premium and upside from its last closing price. It said the offer price only represented a 7% and 12.2% upside from the last closing price and OSK Research's previous fair value respectively. For IJM Land, Hwang-DBS Vickers Research said at RM3.65 per share, the deal appeared attractive valuing IJM Land at 2.4 times net tangible asset. It said this was an attractive price to migrate to a new company that would have an estimated market cap of RM7.2bil, 9,023 acres of land bank, RM3bil asset size and RM2bil revenue. While details of IJM Corp Bhd's stake in the new company are sketchy, Hwang-DBS understood it would be substantial to enable it to consolidate earnings. It said IJM Corp would convert the RM400mil nominal value of IJM Land redeemable convertible unsecured loan stocks (RCULS) into 229.9 million new shares of IJM Land at RM1.74 per share, raising its stake to 69% from 63% (before conversion of warrants). Assuming IJM Corp ends up with a 41% stake in the new company based on the current offer prices and conversion of RCULS and warrants, this will work out to RM3.6bil versus its current 63% stake in IJM Land of RM2.1bil, it said. IJM Land, IJM Corp and MRCB have a common shareholder, the EPF, which holds a 7.8%, 15.6% and 42% stake in the three companies respectively. DUBAI: Al Murjan Real Estate, developer of a US$3 billion (US$1 = RM3.13) housing project in the United Arab Emirates, has filed for bankruptcy after running into financial difficulties, the Financial Times reported yesterday. The company filed for insolvency in the emirate of Sharjah and two liquidators have been appointed, the FT reported, citing documents it had obtained, and cited lawyers saying that it was the first court-mandated bankruptcy of a distressed property project in the emirates. Property buyers would likely find it difficult to recover downpayments they made on homes in the 8,000 home White Bay development, which Al Murjan had started to build in another emirate, Umm al-Quwain, the newspaper said. As property prices plummeted some 60 per cent since peaking in 2008, more than half of buyers had not maintained payments, the FT reported.